"Second Coming." Rom smashes into the vault area of Laserium Corporation, chasing a Dire Wraith. The Wraith is in the custody of the Stryker gang, led by Archie Stryker, and they're at the Laserium to steal from the vaults. Rom ignores the humans and dispatches the Wraith to limbo, but Stryker only sees a human being turned to ash. When the police arrive and capture him, he tells the chief of police, who is also secretly a Wraith, that he will do anything to stop Rom. Next, Rom returns to the home of Brandy Clark to seek out her council. Brandy's boyfriend Steve Jackson sees this and calls the police, thinking Brandy is in danger. The Wraith-chief comes along and has the police employ "top secret" (actually Wraith-made) weapons. Rom defeats the police, and his analyzer shows that the chief is a Wraith, so he sends him to limbo. Again to everyone else, it looks like Rom has killed someone. Rom then departs, not wishing to cause Brandy any further trouble. Meanwhile, Stryker vows to get even with the Spaceknight. Story - 4/5: This is another strong story by master comic writer Bill Mantlo. In the first scene of the story, Rom crashes into a vault in pursuit of a Dire Wraith. The Wraith is disguised as a human who runs the Laserium corporation, a company that develops laser technology. Criminal Archie Stryker and his gang have kidnapped the Wraith, because as the head of the company, he has access to the vaults. Rom thus interrupts a heist of the Stryker gang. Rom, of course, is not interested in human considerations like theft. He's here to send Dire Wraiths to Limbo. Thus he ignores the humans and focuses in on the Dire Wraith. He uses his Analyzer to prove to his cyborg eyes that this is, in fact, a Wraith, but to Stryker and his partner, it looks like Rom is attacking another human. Although Stryker doesn't really care about the Laserium Corporation's boss, he has a strong sense of loyalty to our race, and decides to help defend his former captive against Rom. He does this by turning the powerful lasers of the Laserium on Rom. This doesn't work, as Rom is more powerful than the lasers, and in the end, the Wraith is dispatched to Limbo. Stryker, however, is galvanized. When a Wraith disguised as a cop arrives to arrest him, Stryker declares that he'd do anything to defend humanity against the "evil robot" (Rom). This will have profound implications for him later, as the Wraith overhears it and decides to use Stryker against Rom. In the next scene, the beautiful young Brandy Clark, the West Virginia native who was Rom's first acquaintance on earth, is being examined by her doctor. She tries to convince her family, and her boyfriend Steve Jackson, that Rom didn't kill humans, and that he is here to help. But they think she is just hallucinating. Frustrated, Brandy heads outside with her dog, and there she encounters Rom, who has come back to see her. He tells her that he is just there to ask more questions about our culture, but the narration clearly indicates that now, after 200 years as a lonely Spaceknight, feelings of desire are starting to arise in Rom. This foreshadows one of the most tragic and beautiful love affairs in all of comics -- the one that will spring up between human earth girl Brandy, and the cyborg Rom. Brandy already senses the noble integrity of Rom, and at this point, it's pretty clear that Steve Jackson never stood a chance. It's a treat to see this romance budding so quickly, as it is one of my all-time favorite love stories in comics. Rom and Brandy have only a short time together, however, before Steve Jackson sees them and calls the police. Unbeknownst to everyone else, the police chief, who still has Stryker in his squad car, is a Dire Wraith, and when he arrives, he tries to use Wraith technology to kill Rom. First he has his officers use "top secret military equipment" (which is of course Wraith science) to fire a laser-bazooka at Rom. This damages him, but he smashes it. Next the Wraith uses a sonic attack through the squad car's siren, which almost fells Rom. But he fights through it, throws Stryker from the car, and dispatches the Wraith. Although Rom is successful, once again he has the difficulty that, to normal humans, who cannot see what the Energy Analyzer shows Rom's cyborg vision, he appears to have killed another human. The townsfolk are in a panic. And Archie Stryker, who has now watched, or so he believes, two humans killed by Rom, vows revenge on Rom on behalf of the whole human species. Stryker's solidarity with his fellow man is a touching and interesting character trait in an otherwise hard-boiled criminal. Stryker probably never before gave thought to his fellow man, and if it were a human killing other humans, he might not care. But he draws the line when an alien robot is involved, and this deliciously normal behavior makes Stryker seem all the more realistic. This is nothing unusual for Mantlo, as we will see in upcoming issues -- he had a knack for writing realistic characters. Overall, this is a fun and interesting story. Several new supporting characters are introduced who will play regular roles in the future, including Steve Jackson and Brandy's parents. Archie Stryker will also figure prominently in several upcoming issues a well. Mantlo's scripting is again superb, and his third-person narration continues to charm and delight me. Here again is the master, at the top of his game. As with my issue-1 review, I give this story a 4/5, not because it is deficient in any way (it is quite sound! ), but rather, because I know even better stuff is coming in the future. Art - 4/5: Buscema's work continues to be outstanding. His figures are kinetic and his panels full of action. He does an excellent job with some very dense layouts, including one page with 12 (!) panels -- double the standard 6 of the day. He manages to draw these layouts so that they are simply natural-looking, and not cramped. I can't think of many other artists (Perez being one of the few) who could pull layouts like these off with such seamless beauty. His work on the special effects is also top notch. Cover - 3/5: I have not been able to discover who did the cover of this issue. It looks fairly good, although Rom's pose is rather awkward -- which makes me suspect that Sal Buscema did not draw the cover (because his poses are generally more natural looking). Additionally, the neutralizer is several sizes too small for Rom's hand -- another mistake I would not expect to see from Buscema. On the other hand, this is only the second issue, and clearly Buscema was still getting a feel for how he wanted to draw Rom, so perhaps he did this cover. Either way, the awkward pose and off-sized Neutralizer make the cover somewhat inferior to the interior art. Overall - 4/5: Overall, this is another solid, enjoyable book from the team of Mantlo and Buscema. They are clearly already firing on all cylinders, and the story is already engaging. I never read this issue originally (my first purchase of Rom on the news-stand was issue 5), and in fact I only purchased it a few months ago, so this was my first time ever reading this issue. 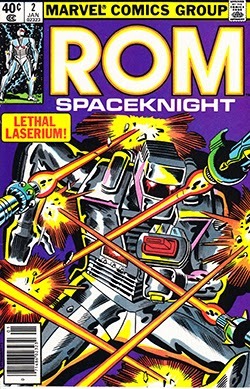 What a treat it was to be able to read a brand-new Rom story I had never before seen. It's such a shame they don't make comics like this anymore.